Pashtun culture has suffered over the past few years with its link to the Taleban and Osama bin Laden. But that image may soon be revised with the efforts of two English teachers, Robert Sampson and Momin Khan Jaja, based in Pakistan's North-Western Frontier Province. Working tirelessly over four years, they have translated the collected works of celebrated Pashtun poet, Rahman Baba, into English. And one theme that is entirely absent from Rahman Baba's work is jihad, or holy war. The weighty volume, entitled The Poetry of Rahman Baba - Poet of the Pashtuns, is more than 900 pages long and attempts to show the Pashtuns' devotion to peace, love and selflessness. These are the predominant thoughts that run through Rahman Baba's poetry, which most Pashtuns find relevant even in today's age of violence and terrorism. There is hardly a Pashtun who does not know some of Rahman Baba's work by heart. Pashtun intellectuals say it is far more than poetry for those who understand it. Many feel that for the Pashtuns, it is a book next only to the Koran. 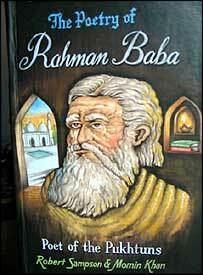 Saidu Baba, a revered saint from the Pakistani hill district of Swat, is known to have said that if the Pashtuns were ever asked to pray on a book other than the Koran, they would undoubtedly go for Rahman Baba's work. Having remained restricted to the Pashtuns for more than 300 years, the poetry is now available to the entire world. And the translators are hoping they have done justice to it. "To keep up with the idea and thoughts of a poet is very challenging," Momin Khan Jaja told the BBC News website. "But we tried our best to be genuine and sincere." Co-translator Robert Sampson hopes the translation will lead to a more widespread awareness and appreciation of a poetry that has had a deep influence on Pashtun life. The book includes four chapters on the poet's life as well as a commentary on his themes, which may help those who know little about sufi thought from three centuries ago. "There is no doubt in the sanctity of Mecca, but a donkey won't become a Hajj pilgrim by just going through the motions," reads one of his famous couplets.